Personal capital has a very nice FREE high level portfolio dashboard for assessing your overall asset diversification. It offers more that just mint for rich people and provides very nice consolidated views across all your taxable and retirement accounts. 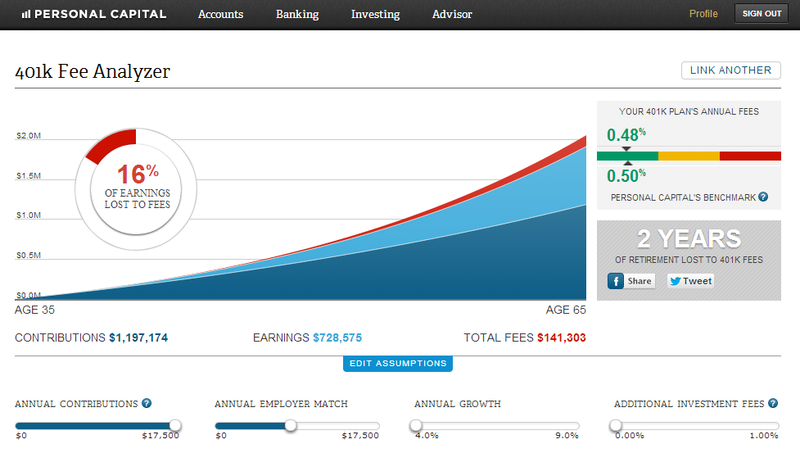 They are also do managed money portfolios, but you can have this interface for free without being a client. Note PersonalCapital.com is much more geared towards investment accounts and analysis, rather than mint.com’s focus on daily general budgeting and monthly planning. They are similar products but they offer solutions for different parts of your financial life. You can (and probably should) use both of them together. The PersonalCapital.com dashboard has a “Investment Checkup” tool, which analyses your overall portfolio risk as green/amber/red based purely their preferred asset allocation. The asset allocations seems to be usual financial advice of equity/fixed income ratio (aggressive: 75% equity/25% fixed income or conservative:50% equity/50%fixed income), but they will add alternatives (REITs, commodities up to 12%). This is basically modern portfolio theory (MPT). It is a nice tool if you believe in MPT – personally we are more interested in absolute return strategies, but if you like to analyse for asset class mix diversification it does the job nicely. Risk There is a risk diversification checker which can analyse if you have too much concentration in one stock. Allocation tool The ability to drill down through your portfolio through all its parts is really nice. This can be done across all or a subset of accounts. They also seem to be adding more tools, and doing updated releases. For example last month they improved the historical charting of your accounts to go further back in time – not just 30 days. - ability to add stocks manually was very useful for accounts that don’t have online connectivity. - drill down through comprehensive asset class hierachy (eg equity has “mid cap”, “large cap” (etc) equity sub sectors). Much more detailed than mint.com asset class categories. - Potential security issue with centralising of all your username/passwords (similar to mint). You are either comfortable with this or not. If not the service is a non starter. - doesn’t handle FX / international accounts. For example, if it could update balances for foreign bank accounts based on an end of day FX rate that would help us a lot. - can represent options under asset class “alternatives” -> “other”, but it isn’t really geared toward combining option/stock into one risk position. It would only consider the stock component of a married put position and would say you are “overweight” the stock even if you have a put option on it in the same portfolio with a delta of 90% (so are essentially neutral effect on your portfolio). - They could probably use an account grouping feature. We have about 40 accounts and it would be nice to be able to group by taxable/non taxable – you *can* group accounts but have to select each account manually each time. Usage tip (opinion) – when you add your accounts don’t put all your general finances like checking accounts & credit cards into personal capital. Only add one’s that generate interest (eg savings) or brokerage or retirement. Use mint.com to track general spending and copy the mint.com “cash balance” and “credit cards” heading summary amounts over once a month. Otherwise it ends up updating your net worth in personal capital everytime you buy a sandwich. It has worked very well for us having personal capital for true financial acccounts and mint.com for general monthly expenses. Mint.com is way better for general living transaction tracking (personal capital can do it, just not as well). If you want a holistic view of your finances it is very good value for $0. There is no hard sell on money management but you do get a free consultation with one of their FAs. Verdict at least try it out – we were very impressed with the user interface presentation & functionality first time out. This entry was posted in Personal Capital, Risk Tools by 30DayTrading. Bookmark the permalink.